No matter which delicious BLUE Homestyle Recipe you give your dog, you can be sure you're providing them with rich, wholesome nutrition-each formula contains only healthy, natural ingredients. 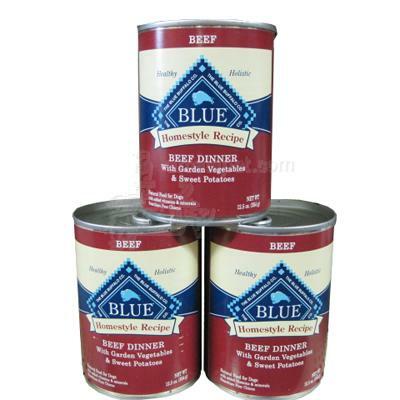 Real beef provides them with essential amino acids they need every day. Beef, Beef Broth, Beef Liver, Carrots, Peas, Sweet Potatoes, Whole Ground Brown Rice, Whole Ground Barley, Oatmeal, Guar Gum, Salt, Dicalcium Phosphate, Flaxseed, Blueberries, Cranberries, Potassium Chloride, Carrageenan, Cassia, Vitamin A Supplement, Vitamin E Supplement, Vitamin D3 Supplement, Vitamin B12 Supplement, Niacin (Vitamin B3), d-Calcium Pantothenate (Vitamin B5), Riboflavin (Vitamin B2), Pyridoxine Hydrochloride (Vitamin B6), Thiamine Mononitrate, Folic Acid (Vitamin B9), Biotin, Zinc Amino Acid Chelate, Iron Amino Acid Chelate, Copper Amino Acid Chelate, Manganese Amino Acid Chelate, Sodium Selenite, Calcium Iodate, Choline Chloride.